Eat a healthy diet. It should be low in saturated fat. It should also be rich in fruits, vegetables , and whole grain foods. Spirometry. National Lung Health Education Program website. Available at: http://www.nlhep.org/Pages/Spirometry.aspx. Accessed September 15, 2015. 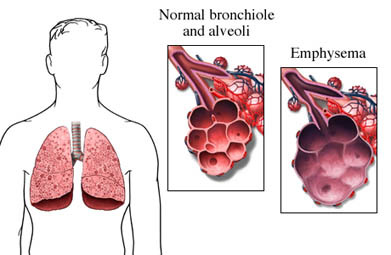 What is COPD? National Heart Lung and Blood Institute (NHLBI) website. Available at: http://www.nhlbi.nih.gov/health/health-topics/topics/copd. Updated May 22, 2014. Accessed September 15, 2015. Global Strategy for the Diagnosis, Management, and Prevention of Chronic Obstructive Pulmonary Disease 2017. Global Initiative for Chronic Obstructive Lung Disease website. Available at: http://goldcopd.org/. Published January 2017. Accessed February 22, 2017.